Gold prices today (Wednesday) were up a whopping $18.70 an ounce (up 1.43%) as of 12:30 p.m. EDT. Spot gold traded at $1,307.30 an ounce after closing at $1,288.60 an ounce in the previous session. U.S. gold futures for August delivery were up $20.20 at $1,304.20 an ounce. 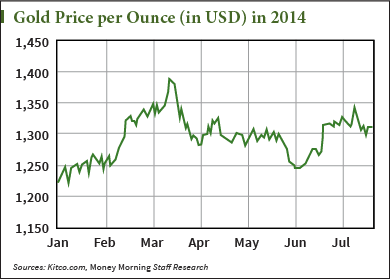 December gold – the most actively traded contract right now – was up $23.80 at $1,309.10 an ounce. Until today, the gold spot price per ounce hasn't finished a trading session on the London p.m. fix above $1,300 an ounce since July 28th – our gold price chart shows the yellow metal's movement. Geopolitical conflicts are pushing gold prices higher. The safe-haven investment tends to enjoy gains when fear is in the air. For instance, the morning of July 17, the price of gold spiked when news that Malaysia Airlines Flight 17 – a passenger plane that carried 298 people – was shot down potentially by pro-Russian separatists in Ukraine. Spot gold gained 1.3% by midday that day, and August gold futures climbed by $9 an ounce. In the same vein, gold prices shot up this morning on news that Russian soldiers were gathering at the eastern Ukraine border, following heavy fighting between Ukraine forces and pro-Russian separatists that erupted in the city of Donetsk. NATO reported that approximately 20,000 Russian troops have amassed so far, and expressed worries that Russia will mask entry into Ukraine under the guise of a "peace-keeping mission." The troop buildup "adds to the sense that the crisis with Ukraine is ongoing and could escalate," Capital Economics Ltd. emerging markets economist William Jackson said to Bloomberg. Last week, Europe and the United States heaped more sanctions onto Russia. Russia in turn banned soy exports from Ukraine. In the last 24 hours, Russian president Vladimir Putin has also ordered a ban on certain food exports from the countries that have sanctioned his nation – a clear signal he's not changing course. An emailed statement from the Kremlin after market close yesterday asked the government to make a list of banned produce.